Sat., Feb. 11, 2017, 11:55 p.m.
Valentine’s Day may still be a couple days away, but there was a love-fest going on in Moraga, California, all day Saturday. And it was televised by ESPN. No chocolates, maybe, but there were one heck of a lot of bouquets thrown Gonzaga’s way. It started early in the morning, West Coast time, with the network’s GameDay crew on the court in Saint Mary’s McKeon Pavilion. 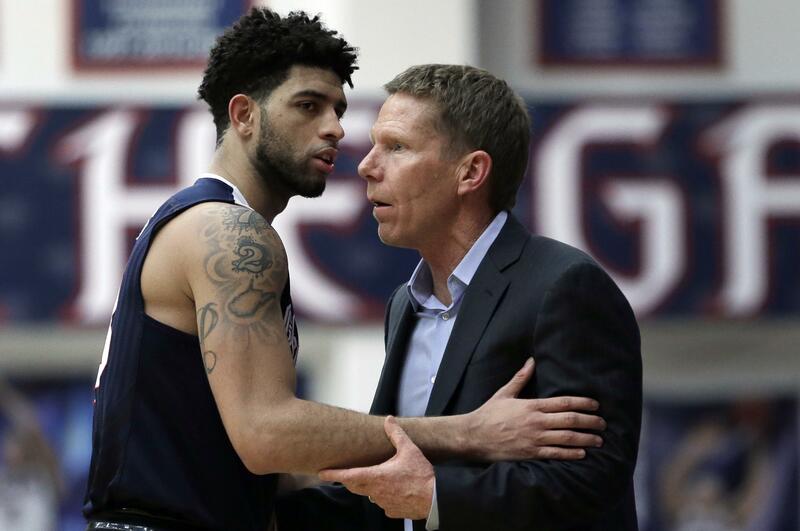 And it continued throughout top-ranked Gonzaga’s 74-64 win over the host Gaels. Actually, it continued well after, when Mark Few made an encore appearance on SportsCenter, where he was given an impromptu spelling test. But in the real test, the one against the 20th-ranked Gaels and the 3,500 folks jammed into their “bandbox” of an arena, how did the Bulldogs do? They passed that relatively easily, led by Przemek Karnowski’s 19 points and nine rebounds and Johnathan Williams 17 and nine. Let’s be clear here. No one does a big game better than the Worldwide Leader. And Saturday, the network decided this was a big game. There they were in the morning, Rece Davis, Jay Williams, Seth Greenberg and Jay Bilas, sitting behind their desk at halfcourt, inducing boos and groans from the Saint Mary’s faithful as they talked glowingly of Gonzaga’s season. Davis set the tone, looking around at the cramped confines of McKeon and labeling it a bandbox. And marveling how it takes you back to the essence of the game. There was Greenberg, who used to coach 500 miles down the interstate at Long Beach State, saying “I think Nigel Williams-Goss make this team a Final Four team,” as boos rained down. And then launching into a nuanced defense of his statement. Defense was the subject of Bilas’ morning assessment of the Zags, and he reinforced something Gonzaga fans have known for a while: This is Few’s best defensive team. Which is part of the reason, seemingly, ESPN switched the starting time of this one from 7 to 5:15 p.m. to showcase Few’s team to an East Coast audience. But the morning show was only the appetizer. The main course was the game itself and ESPN had that covered from every angle – maybe too many. The best angles were those covered by play-by-play man Dan Shulman. Shulman, if not a No. 1 seed among those in his role, is at least a strong second or third. And next to him was Bilas, who kept his usual off-the-wall remarks to a minimum and displayed a depth of Gonzaga knowledge that is unparalleled among national commentators. There were enough Gonzaga history lessons, from basketball’s place in Fr. Robert Spitzer’s grand plan to resurrect the school’s attendance before the turn of the century, to the court-storming nature of each Gonzaga WCC road game, to give a newby East Coast observer plenty of Twitter fodder. And, when needed, there was game analysis as well. If something happened on the court, Shulman and Bilas pointed it out. If it was funny, they joked, like the time Karnowski airmailed a pass into the stands. And if it was serious, they used just the right tone. And reasons. Bilas is rare among ESPN folks in that he’s not afraid to take on the powers that be, from the NCAA – he may go a bit overboard in his social media criticism of that entity – to the officiating. The latter was on display again in this one, as Bilas, by unofficial count pointed out no less than five calls he disagreed with. Funny, but they all went against the No. 1 team in the nation. It’s not as if ESPN’s telecast was perfect, though. There was the mispronunciation of Gonzaga’s name in the taped musical intro – you know the mispronunciation we’re talking about – and there were a few times the broadcast intruded into the game. The worst of those came with 2 minutes left in the first half. Sideline reporter Maria Taylor did a live shot with Greenberg and Williams on the baseline under GU’s basket – while the Zags were running their offense. But that’s how games are presented at the blue bloods of college basketball’s venues. And for this night at least, Gonzaga and Saint Mary’s showdown was treated that way. Call it an early Valentine’s gift and let it go at that. Published: Feb. 11, 2017, 11:55 p.m.